The project is located in three regions in Bulgaria (Kardzhali, Haskovo and Stara Zagora) and one region in Greece (Rhodope). The objective of the project is to construct a 183km long gas transmission pipeline connecting Komotini in Greece with Stara Zagora in Bulgaria. The Interconnector Greece Bulgaria pipeline is designed for gas transport in both forward and reverse flow. 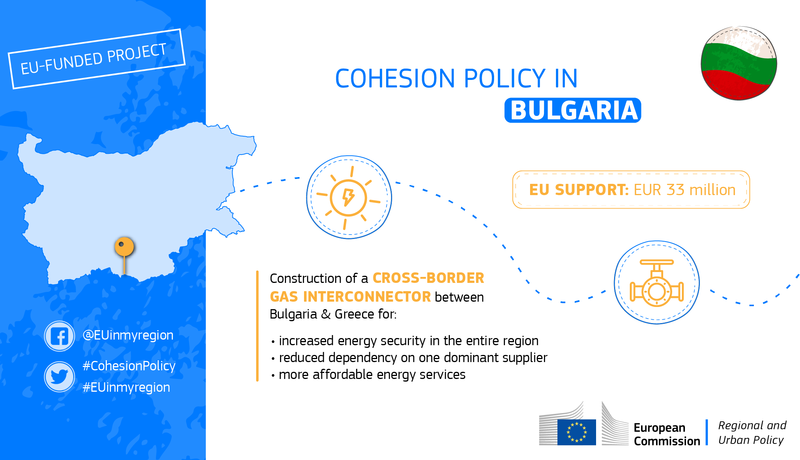 The project aims to connect the national gas transmission systems of Greece and Bulgaria and provide diversification of routes and sources for gas imports to Bulgaria, Greece and the region of South East Europe. The project concerns the construction of a 11.1 km-long dual carriageway road from Nebory to Bystřice. Moreover, the project also involves the diversion of second and third class roads, local roads and the construction of a feeder road to cater for local traffic entering and exiting the main road. 25 bridges and about 17 km of noise barriers will also be built. Due to its crucial location, the project is part of the comprehensive Trans European Network TEN-T and the road is a major transport link between D48 motorway and Slovak D3 motorway. 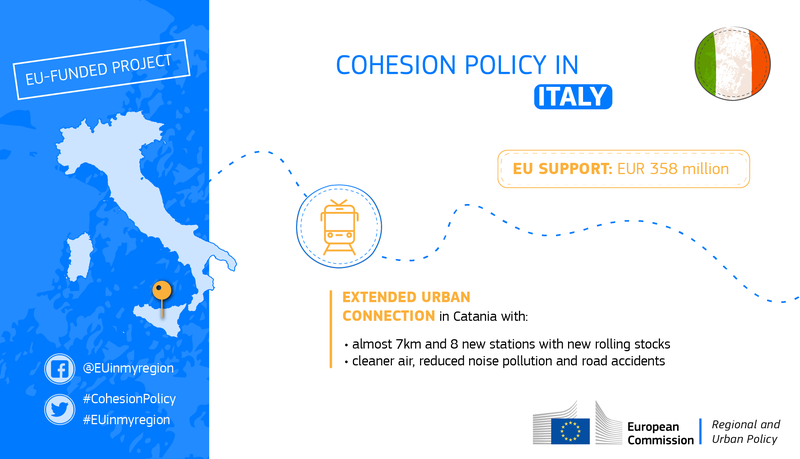 The road will have significant positive impact on traffic connections at regional level as well as for international traffic to Slovakia and Poland. 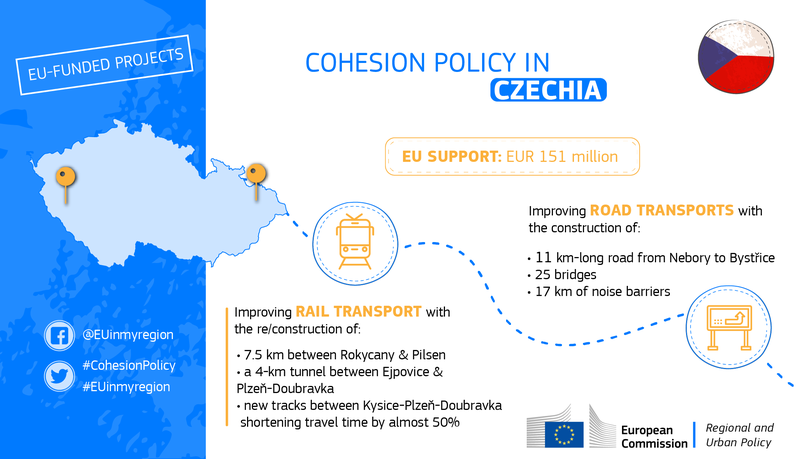 The project consists in: the reconstruction of 7.5 km between Rokycany and Pilsen; the construction of a new 4-km tunnel between Ejpovice and Pilsen-Doubravka which is the longest railway tunnel in Czechia; and the purchase of new tracks between Kysice and Pilsen. This will shorten travel time by almost 50% on this modernized section. And will increase accessibility and attractiveness of Pilsen as a regional economic centre. 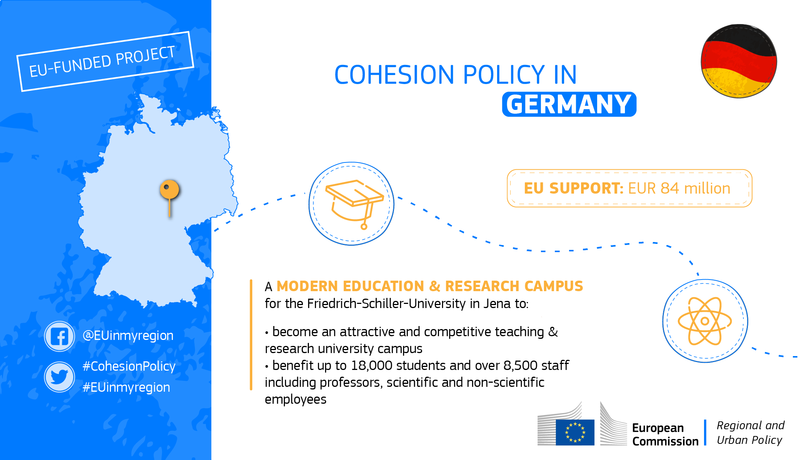 The aim of the project is to establish a modern university campus for teaching and scientific research. The campus will consist of 4 modern buildings, namely university data centre, the faculty of mathematics and IT science, faculty of psychology as well as parts of the university library. Currently all four facilities are situated widespread across the city of Jena. The current buildings do not meet the energy efficiency requirements, nor the users’ needs. The modern campus will guarantee an attractive environment for scientific research and teaching. The co-financing is requested for two out of four buildings: the university data centre and the faculty of mathematics and IT science. The other two buildings will be financed exclusively from national resources. The investment is under preparation, with the start of construction planned for August 2020, and the start of operation in 2022 for data centre and 2023 for the faculty of mathematics and IT science. This is a first major project in Germany. 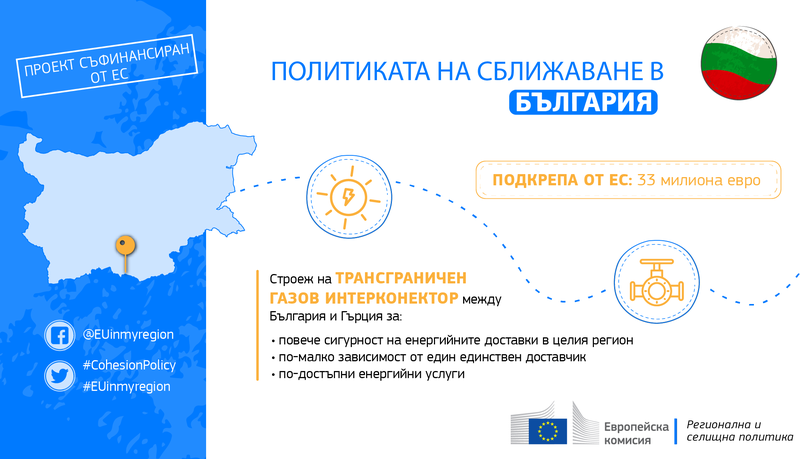 Public Sector Network "Syzefxis II"
The overall objective of the project is to improve the telecommunication infrastructure of the existing public administration network with lower costs. 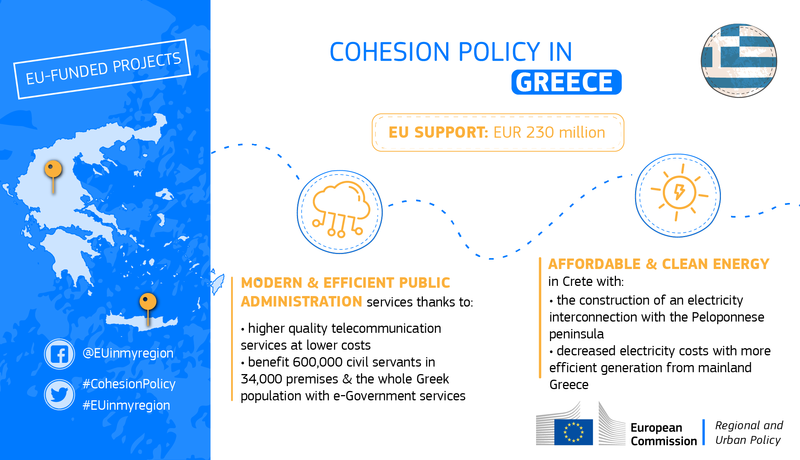 This project, expected to be completed in 2023, will benefit 600,000 civil servants in 34,000 premises as well as the whole Greek population with valuable e-Government services supporting administrative reform and bringing increased transparency to the functioning of the public institutions. The purpose of the project is the construction of electricity interconnection between the island of Crete and peninsula Peloponnese. The Project includes: two new submarine cables with the length of 135 km each (making it the longest subsea alternate current interconnection in the world); upgrades of the existing - and construction of new - transmission lines, underground cables and substations in the Peloponnese and Crete, and static synchronous compensator on Crete. 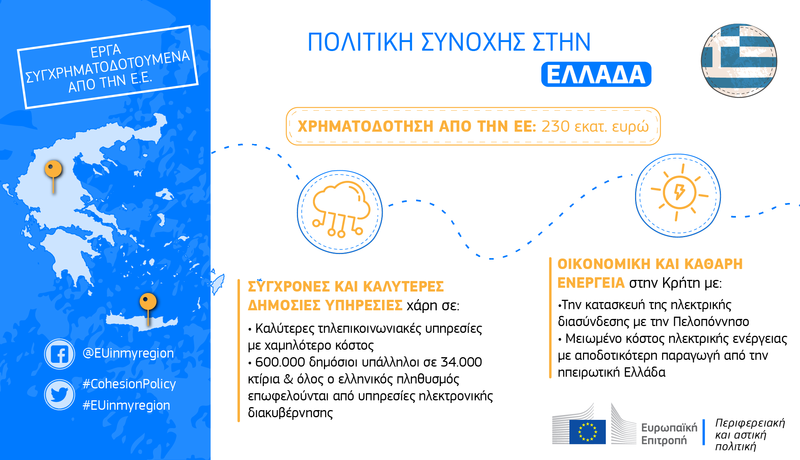 This EU investment, implemented between 2018 and 2020, will decrease the electricity generation costs in Crete by replacing expensive oil fired generation units with more efficient generation from mainland Greece, providing for 34% of Crete’s total electricity demand in 2021. 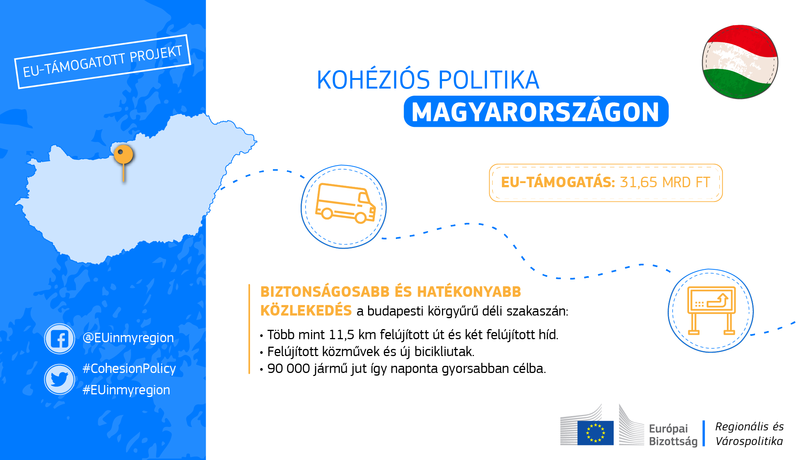 The project involves the upgrading of 11.55 km of westbound route of existing 2x3 motorway M0 (Budapest Ring Road). 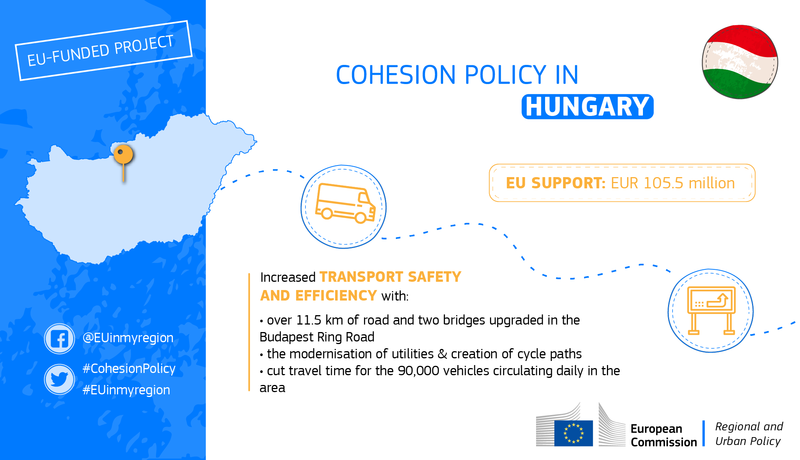 The upgrade will involve pavement reinforcement from flexible to rigid on the entire section, the upgrading of two bridges (770 m-long Háros Danube bridge and 499m-long Soroksári Danube bridge ), including the modernisation of utilities and the creation of cycle paths. This project will cut travel time for the 90,000 vehicles circulating daily in the area concerned with positive impact on the environment, given the reduced emissions associated with congestion. 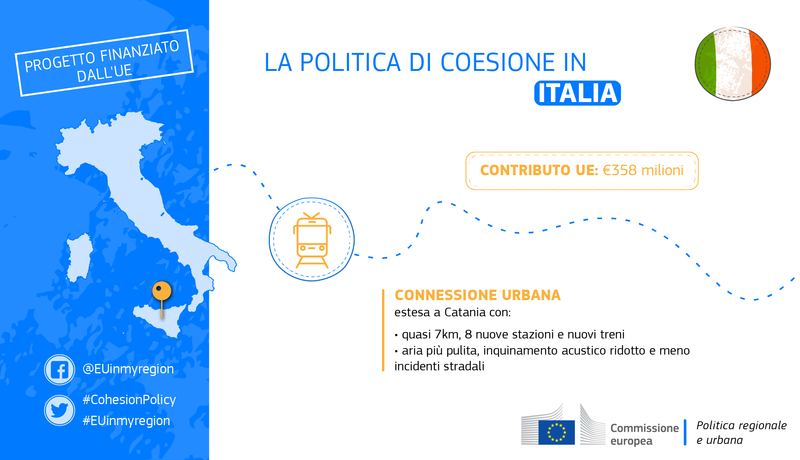 The project consists in the extension of the current section of the Circumetnea Railway line operating in the centre of Catania to the south. The 6.8 km line will be built underground and will have 8 stations. It pursues several objectives: reduction of congestion of the road network, reduction of CO2 emissions and other atmospheric pollutants, reduction of noise pollution, reduction of road accidents, promotion of intermodal transport, and improving the efficiency of the railway network. The project also includes the purchase of rolling stock worth ca. EUR 60 million. The aim of the project is the construction of a 9.5 km underground tunnel with a width ranging from 3 m to 4.5 m to transport water from the reverse osmosis plant in Pembroke to the Ta’ Qali Reservoirs. This will allow the Water Service Company to refine its water-blending and provide drinking water of a uniform quality across Malta. It will also increase energy efficiency by reducing pumping frictional losses. 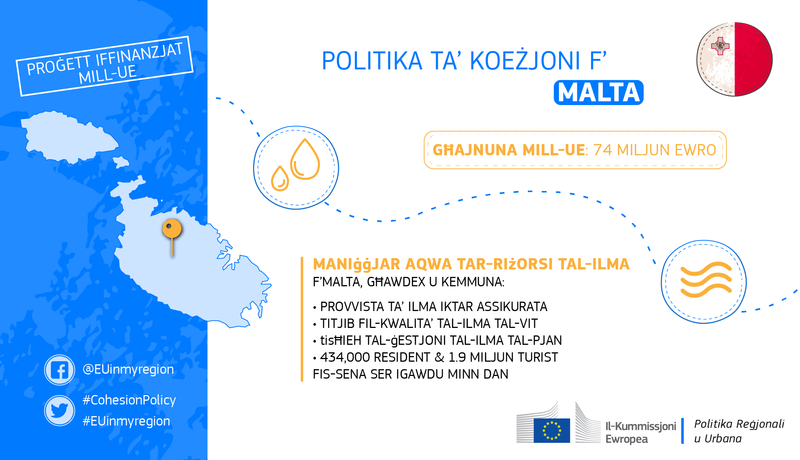 In addition, within the project 15.4 km of the sewer network will be extended to remote areas currently not connected to the network and mostly located in the North, North-West and South-East parts of Malta. Additionally, 4.7 km with performance issues will also be addressed and advanced discharge monitoring introduced to increase the general efficiency of the system.62 km of the wastewater distribution network will be put in place to reach more farmers. 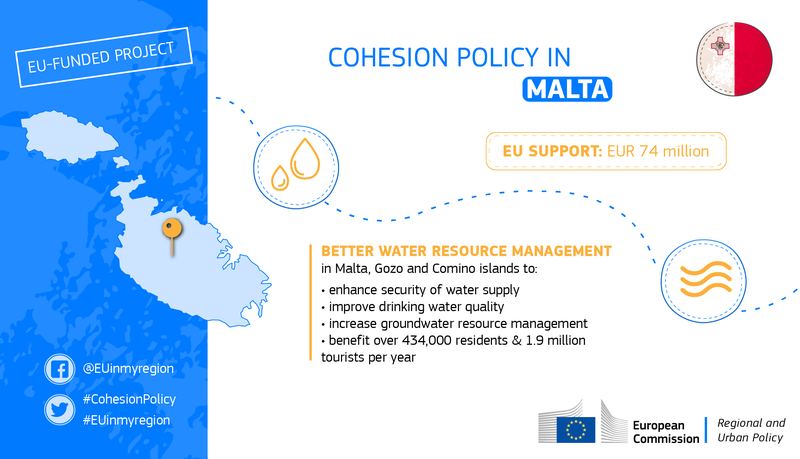 The foreseen benefits for the population, both resident (434 403) and visiting population (1.9 million tourists per year) in the Maltese islands, are: enhanced security of supply in water provision, substantially increased tap water quality, sustainable and extended supply of service, equality in the distribution of good quality water and reduced pollution by increased connection to the wastewater network (6286 population equivalent). The foreseen benefits to the natural environment are: increasing the efficiencies and safeguarding groundwater resources of Malta, supporting the sustainability of groundwater resource use; reducing the carbon footprint of water production processes by enhancing energy efficiency and using renewable energy sources; reducing pollution of the environment; ensuring a better alignment with climate objectives. This is a first major project in Malta. The project concerns the construction/modernisation of quays and hydro-technical engineering structures to allow ships of up to 15 m draught to enter the Port of Gdynia, thus decreasing transport costs, increasing traffic safety, and decreasing negative impact on the environment due to bigger ships and reduction of emission per amount of transported goods. 29.16 km of a new expressway will be built, of which 23.64 km as dual carriageway (2x2) and 5.52 km in 2x3 profile. The new section will link with S2/S79 Warsaw airport junction at the north and with existing S7 bypass of Grójec at the south. A dual carriageway will be built with two lanes and four new road junctions: Jawor Północ, Jawor Wschód, Jawor Południe and Bolków. It includes 25 bridges and overpasses over the express road. 14.8 km of a new motorway will link Warsaw Southern by-pass from Lubelska junction with the existing stretch of A2 motorway near Mińsk Mazowiecki. The project also involves construction of one new road interchange “Konik” with existing national road DK2. A 10 km section of the Olsztyn by-pass along the national road no 16 will be constructed. It will bypass the city of Olsztyn from the south-west and will connect the Olsztyn West node with the Olsztyn South node. The primary objective of the project is to increase safety and security of operations within the Port of Gdańsk and to develop further maritime transport and the competitiveness of the Port. The project will result in the construction and modernisation of the four breakwaters with a total length of 3 957 m, as well as the construction of two internal waterways (approach channels) and turning basin, for safe navigation of vessels in the Northern part of the Port of Gdańsk. 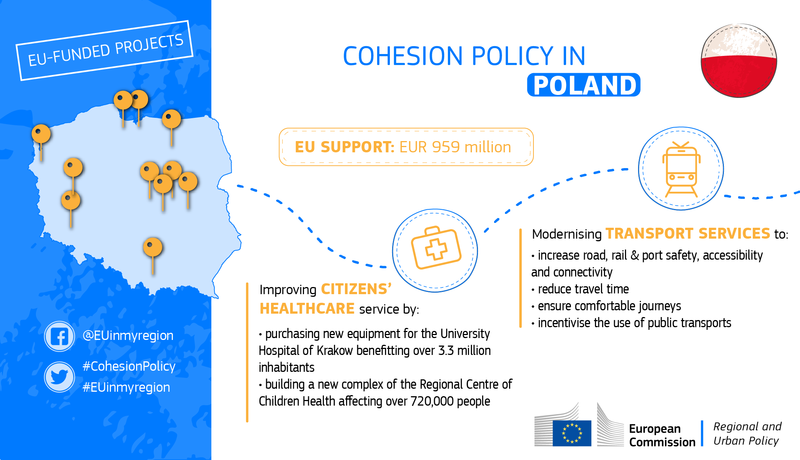 A new complex of the Regional Centre of Children Health in Poznań will be constructed along with the acquisition and installation of equipment. The new hospital building and its health services are expected to increase the quality of healthcare in the Wielkopolska Region and to increase health parameters of children treated and overall higher quality of life of children and their parents. The investment comprises the purchase of 8,580 units of equipment and medical equipment (including assembly, commissioning, training and other services) benefitting over 3.3 million inhabitants by 2021. The project concerns the construction of the fast city rail system called Szczecin Metropolitan Railway, which will connect main municipalities of the West Pomerania region using the existing layout of railway tracks and stations benefitting around half million inhabitants by 2022. The project include modernisation of 23.7 km of line 406 and construction/modernisation of rail stations: 10 new passenger stops and 30 stations modernised. With the project 152 passenger carriages will be modernised and 20 new electric locomotives will be purchased to offer modern, reliable and comfortable journeys to commuters. The project consists of the purchase of 16 Electric Multiple Units (EMUs) for a total of 3450 passengers to be operated by the Mazovian Railway in the Warsaw agglomeration area, mainly on the railway sections Zielonka – Tłuszcz, Warszawa Rembertów – Zielonka and Warszawa Wileńska – Zielonka. 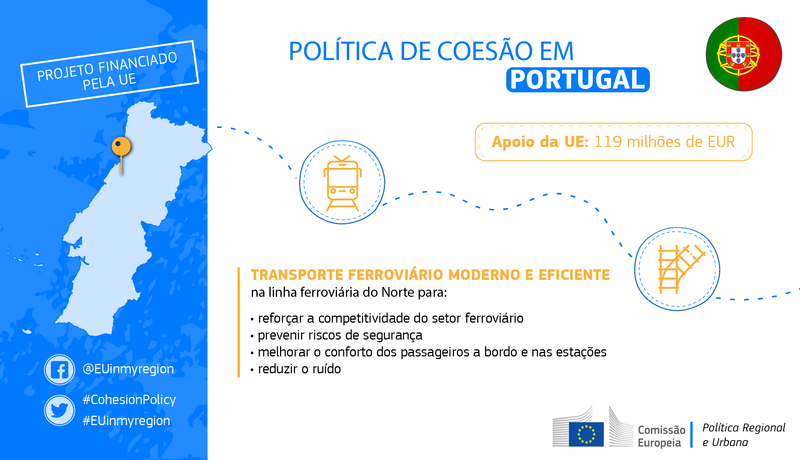 “Linha do Norte” is the main axis of the National Railway Network. It is built along a large North/South coastal corridor and it is part of the Atlantic Corridor, one of the nine main corridors of the Trans-European Transport Network (TEN-T). The modernisation of the Ovar-Gaia section is part of the overall modernisation project for the Northern Line, which is one of the priority actions to strengthen the competitiveness of the railway sector at the regional and national levels. The project addresses the very limited capacity of the existing ring road around Bucharest. It supports upgrading to 2x2 lanes several sections of this road and construction of interchanges Domnesti-DJ602, Oltenita-DN4, Berceni-DJ401, and Mogosoaia-DN1A. 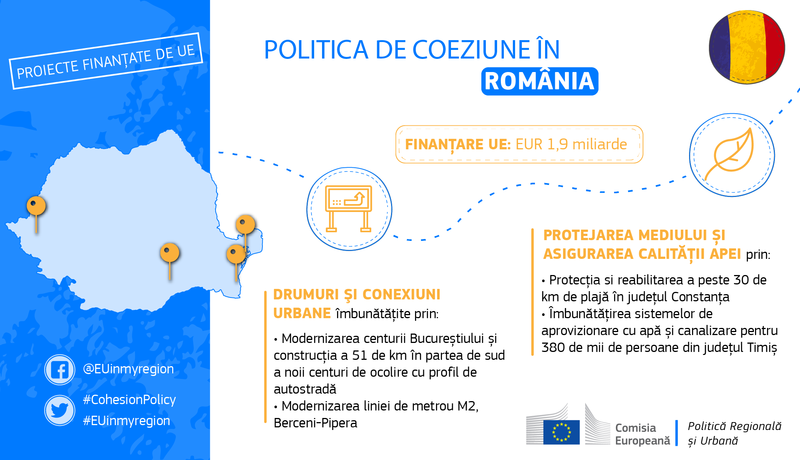 It also supports the construction of 51 Km in the southern part of the new Bucharest Orbital Motorway. The project consists of works on the coastal structures connected to the shore, beach stabilisation breakwaters structures, cliff consolidation works, support walls, dredging, and replenishment of sand on the affected beaches. The main objective of the project is to ensure adaptation to climate change, costal erosion risk prevention and management along the coastal line of the Black Sea in Romania, more specifically in the area of Constanța County. The main objective of the project is the development of sustainable water supply and waste water systems in Timis County, in terms of availability, reliability and quality of the provided services, by promoting investments in the environmental sector, in order to comply with the provisions of the European acquis and fulfil the commitments undertaken for the environmental sector. The project area includes 26 drinking water service areas and 28 wastewater agglomerations with more than 380,000 people accessing better quality drinking water. Improvement of urban public transport services by Metro on Metro Line 2. Berceni – Pipera, Phase 2. The project involves interventions on Metro line 2 the rolling stock and to reconstruct the track substructure and trackside facilities such as electrical and sanitary utilities on the entire 19 km section of the line which runs mostly underground. 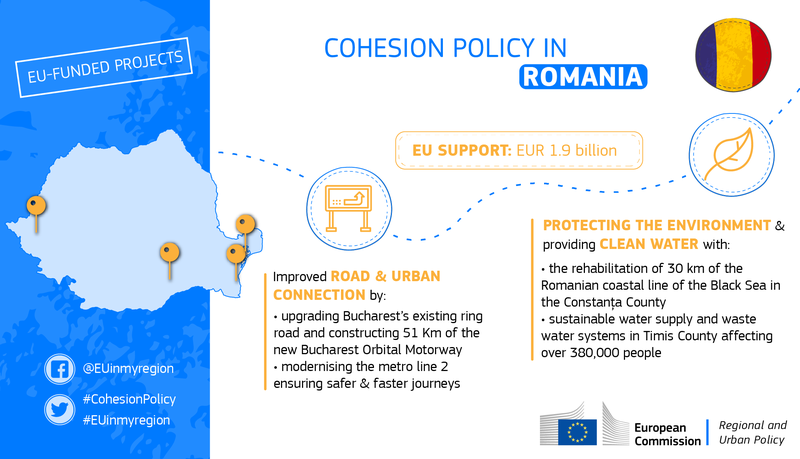 This will ensure safer, more reliable and faster travel for Romanian commuters and travellers.